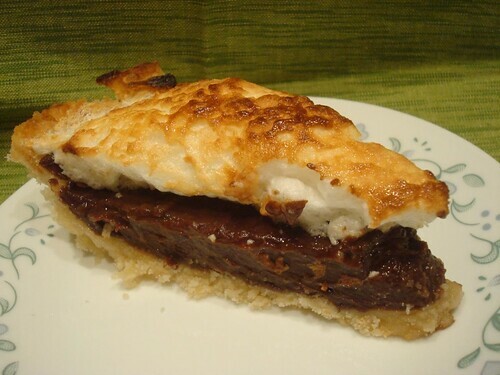 As part of our Pi Day Celebration, the hubby wanted something chocolatey. So I suggested Chocolate Cream Pie and starting looking for recipes. I figured this one might be onto something when the contributor described it as "fudgy". They were right, and so was I. 1. The custard comes together deceptively fast. One minute you are stirring soup, then BOOM! custard. Keep stirring and keep a close eye on it. 3. This pie is divine. Fudgy, rich, creamy, amazing. It doesn't need the meringue for flavor, though it does up the presentation factor. 4. We used the delicious No Roll Pie Crust with this filling. It was a perfect pair.